Gov. George Stoneman. Courtesy California State Library. In January, Gov. Jerry Brown will step aside for fellow Democrat Gavin Newsom. But before Brown and Newsom, there were George Stoneman and Washington Bartlett. It has been 132 years since a Democrat governor of California last turned over the keys to the Capitol’s corner office to another Democrat. Gov. Washington Bartlett. Courtesy California State Library. George Stoneman, the departing governor, had been a Union Civil War general immortalized in the Band’s “The Night They Drove Ol’ Dixie Down.” Stoneman’s performance as a field commander eclipsed his capabilities as a chief executive. Stoneman was elected in 1882. Unlike Brown, he didn’t get a second term, or a third or a fourth for that matter, though he did have a ranch. Social and technological changes of the past 132 years have been vast. But some political rhetoric is uncomfortably similar. Scapegoating immigrants is a time-worn political gambit. Only the faces of the immigrants being demonized change, and 132 years ago, Democrats often did the demonizing. For the Democrats of their day, Chinese immigrants were a scourge. The antipathy had existed since Gold Rush times and wasn’t abated by Leland Stanford’s use of Chinese laborers to push the Central Pacific Railroad through the Sierra. The Workingmen’s Party in San Francisco railed against the Chinese for accepting low wages and blocking white workers from finding jobs. In his inaugural address, Stoneman praised Congress for approving the Angell Treaty which, he said, offered “partial relief from the much-deplored evil of Chinese immigration” by allowing the United States to restrict the number of Chinese entering the country. Contemporary reports of Stoneman during his four years in office vary, depending on the political stripe of the particular publication doing the assessment. Stoneman’s supporters denounced the criticism of him as the equivalent of “fake news,” today’s last-gasp defense against negative publicity. Stoneman did convince lawmakers to create the California Home for the Care and Training of Feeble-Minded Children in Santa Clara County, the California Hospital for the Chronic Insane at Agnew and the Industrial Home for Mechanical Trades of the Adult Blind. The institutions carried on into the 20th Century, under different names. But two issues of real economic consequence were harder: water rights and reining in the railroad monopoly. At the request of 89 legislators, Stoneman called a special session to create more access to water for people whose land didn’t border a river. Despite the initial support, lawmakers did nothing. Water was for fighting over then, too, as Mark Twain may or may not have said. Stoneman, whose first elective officials state railroad commissioner, also called a special session of the Legislature to deal with the Southern Pacific Railroad’s fare and freight price-gouging. Again, lawmakers did nothing. 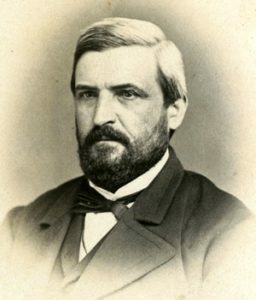 The governor’s desire to reduce the exorbitant fees charged by the railroad was a key reason why Stoneman’s party didn’t embrace him as its candidate in 1886. Instead, the nod went to Washington Bartlett. Like Gov.-elect Newsom, Bartlett had been mayor of San Francisco. Like Stoneman and every governor since, Bartlett recognized the importance of addressing irrigation issues. The Legislature approved the Wright Act, which allowed farmers to band together to form irrigation districts and, more importantly, siphon water from the Kings, Merced and San Joaquin rivers to water the Central Valley. Bartlett’s honeymoon didn’t last long. Afflicted with what’s now called Bright’s Disease, Bartlett died nine months after taking office. S toneman, meanwhile, returned to his ranch, a 400-acre San Gabriel Valley spread called Los Robles. Fire burned Los Robles to the ground. His insurance had lapsed, hobbling rebuilding. Unable to make a go of it, he moved to New York in 1891 to live with a sister, suffering a stroke in 1894 from which he didn’t recover. Greg Lucas is California State Librarian, g[email protected]. He wrote this commentary for CALmatters.